The ringmaster is an egomaniac. He's the only one in the show without a talent and they all worship him...kind of reminded me of Ryan Seacrest on American idol, which is not a kind compa rison if you know how I feel about the Seacrest. I really enjoy the feats of human strength. I'm mesmerized by trapeze artists, contortionists, tightrope walkers and the like. I also really appreciate that any man who performs a feat of strength in the circus is required to wear a unitard. I'll never be able to see a man in a tight onesie and not laugh. It just never gets old to me. This particular man pretzel you see to the left we actually saw. There were man parts everywhere. I was half excited half confused. I left the circus wondereing why no Americans perform feats of human strength. The performers were a real melting pot, from every corner of the globe, but there were curiously no Americans. Why? Fast food and lethargy be damned, there has to be one natural born citizen who can do cool stuff. The acts involving animals really left me conflicted. I consider myself a fervent animal lover. So on one hand, I thoroughly enjoyed watching trained animals perform. But on the other hand, it made me a little sad that they weren't running free in a field somewhere. Apparently you cannot make elephants perform without the threatening crack of a whip. That just breaks my little heart. They were amazing, but it was just so sad. To incentivize the tigers they fed them steak nuggets. Tasty. (I wish I had a steak nugget reward when I do a good job). Seems totally unfair. This spurred an intermission debate over the world's smartest animals. Here are the 5 smartest: 1. Chimpanzee 2. Dolphin 3. Elephant 4. Parrot 5. Octopus. (I don't know what kind of crackpot website doesn't rank poodles up there?!?!?!) 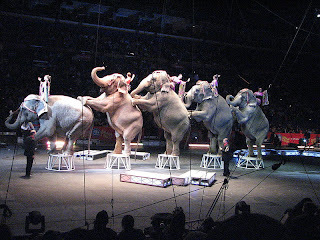 I don't know where this leaves me on my internal struggle on the ethics of the circus animals...I just know that acrobatic pachyderms amaze me. Clowns. I just can't enjoy them. I'm not scared, I'm just not entertained. Also kind of reminds me of the Seacrest. All in all I'll consider it a win. It just occurred to me that the next circus I'll go to is going to be the BRITNEY SPEARS CIRCUS!!!!! Its going to be one hot mess for totally different reasons. Can't. effing. wait.